Hertz vibrations and the longest light wave is less than the difference between the longest and shortest light waves, for some of the shortest oscillations are only a few millionths of an inch long. Doubtless even this gap will soon be bridged over. 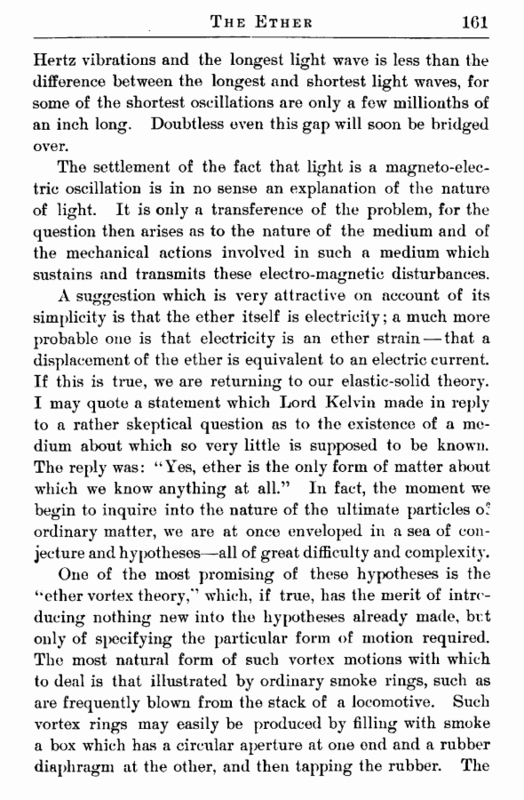 The settlement of the fact that light is a magneto-electric oscillation is in no sense an explanation of the nature of light. It is only a transference of the problem, for the question then arises as to the nature of the medium and of the mechanical actions involved in such a medium which sustains and transmits these electro-magnetic disturbances. 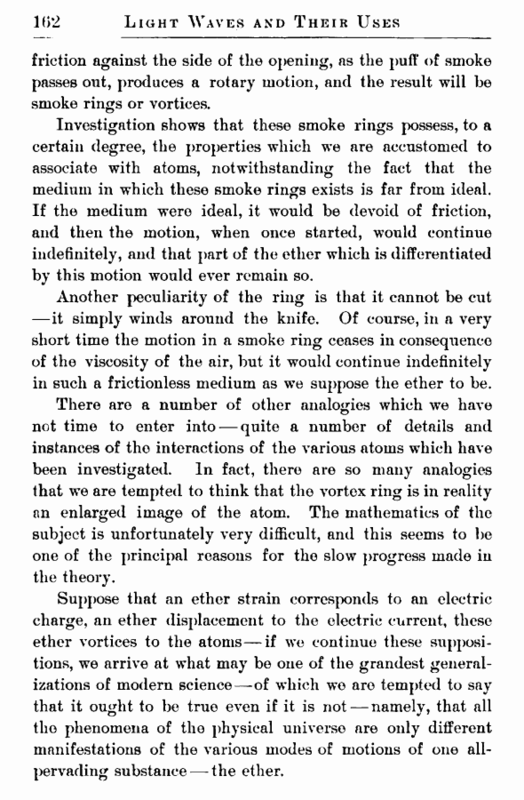 A suggestion which is very attractive on account of its simplicity is that the ether itself is electricity; a much more probable one is that electricity is an ether strain — that a displacement of the ether is equivalent to an electric current. If this is true, we are returning to our elastic-solid theory. I may quote a statement which Lord Kelvin made in reply to a rather skeptical question as to the existence of a medium about which so very little is supposed to be known. The reply was: “ Yes, ether is the only form of matter about which we know anything at all.” In fact, the moment we begin to inquire into the nature of the ultimate particles o; ordinary matter, we are at once enveloped in a sea of conjecture and hypotheses—all of great difficulty and complexity.